Garage door springs size depends on the Wight and type of door. We use only steel springs which insure operation for many years. Chain drive, Screw-Drive, Belt drive or shaft openers. Ask us about the differences between those options. Help you by replacing only the damaged one. There is no need to replace the whole garage door. 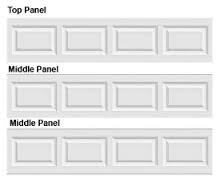 Do you need to replace your garage door? Is it damaged or maybe you want a different design/ quality? We carry the biggest names in the market. 1st United, Clopay, Wayne Dalton, Windsor, Amarr, carriage House and more.